I thought this month instead of doing my usual fitness update, I'd take you along on one of my favorite runs. When you see all the interesting finds along the way, no doubt you'll recognize one of the reasons I love to run so much. 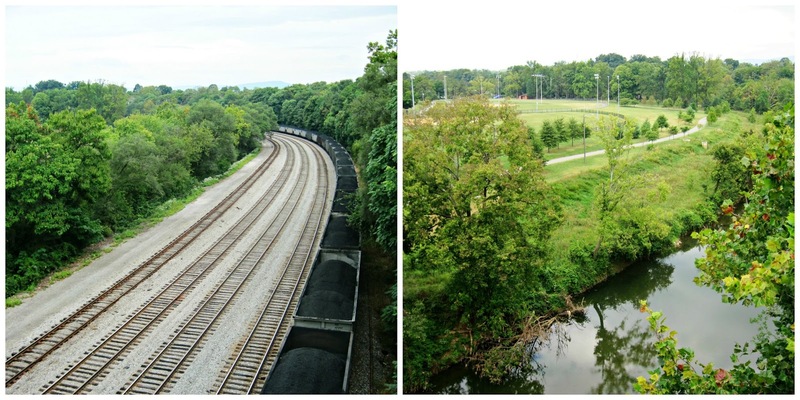 This is a six mile route, called simply "Grandin" and it starts along the greenway next to the Roanoke River. After a mile and a half on the greenway, you pop out on Main Street. Where cool trash can #1 is found. It's a solar trash can, with a compactor in it. And when it gets full? It just emails Waste Management so they know to come empty it. I love the historic picture of Howbert Cabin on the outside. Up a hill on Main Street, and then a right turn onto Sherwood. There is a cactus garden I love there, but it was too weedy this time of year for pictures. I did, however, catch a picture of the door in the tree. It's in front of an Elementary school, and I always wonder as I pass if Atticus Finch put it there. A few hills later, and we come to my favorite part of the run - Grandin Ave. Lots of historic buildings, this area is my old stomping ground. 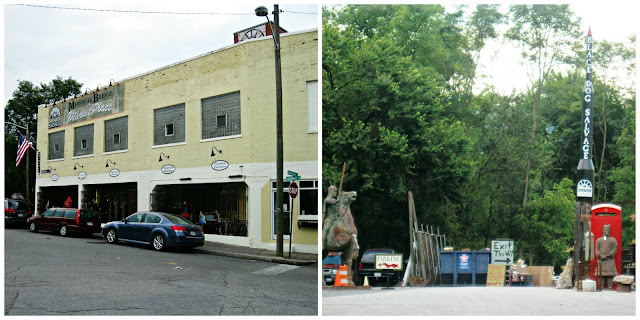 My parents lived here for a few years when I was in middle school, and I loved to ride my bike down to the historic Grandin Theatre (which back then was a dollar theatre). It's since been restored, but back then I loved the shabby Victorian style bathroom parlor on the second floor. 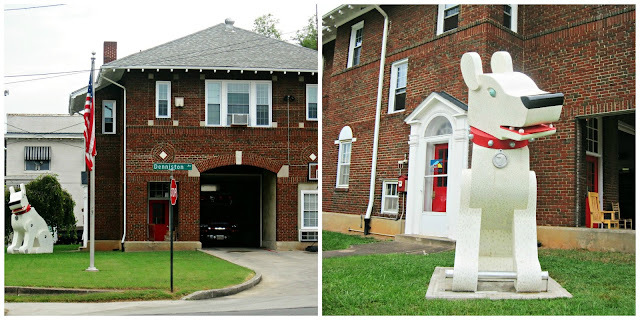 Next up is a cute little firehouse and firedog. One day, the firedog had an unfortunate accident, and his head fell off. Happily, he is no longer the headless firedog. Then we come to cross Memorial Bridge. According to the sign, it's been there since around 1917. On the other side of the bridge is Black Dog Salvage. They have some neat (albeit out of my budget) things if you ever have a chance to wander through. Apparently they are on some tv show, but since we don't have tv I have never seen it. Alright, coolest trash can ever #2. 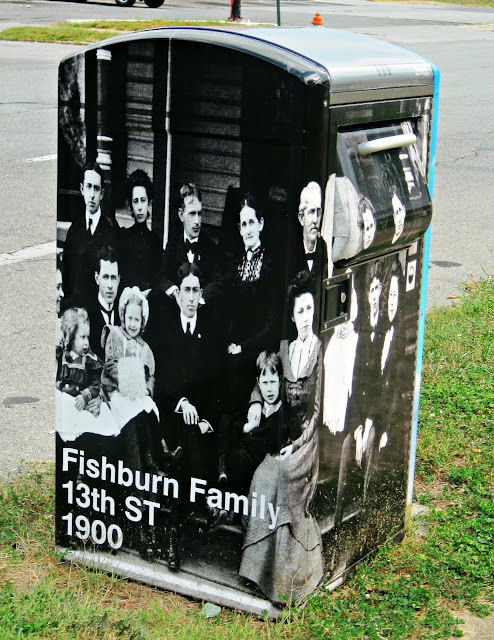 This one has the Fishburn Family on it, and sits on the corner of 13th Street. 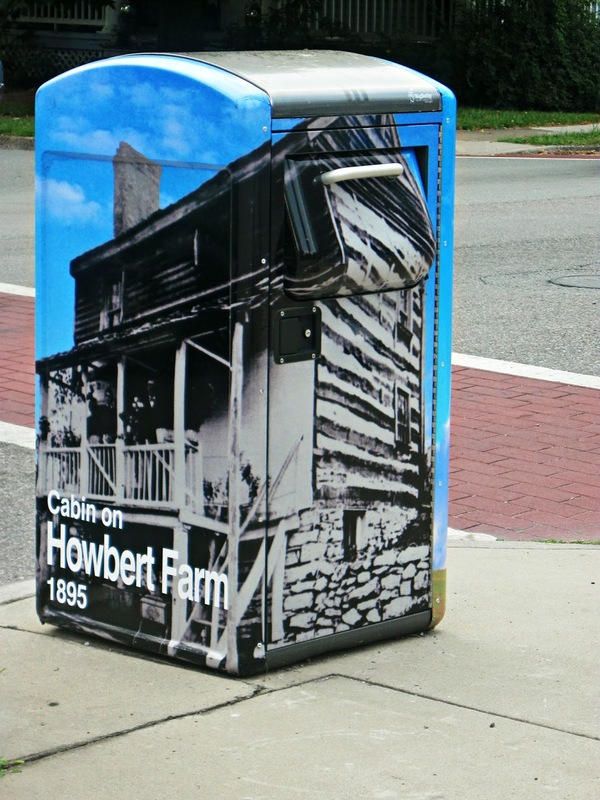 I don't know how many of these trash cans there are in Roanoke, but if there are more I'd love to see them. The picture to the bottom left used to be an apartment complex, but it burned down, and it seems they are building community gardens in their place. 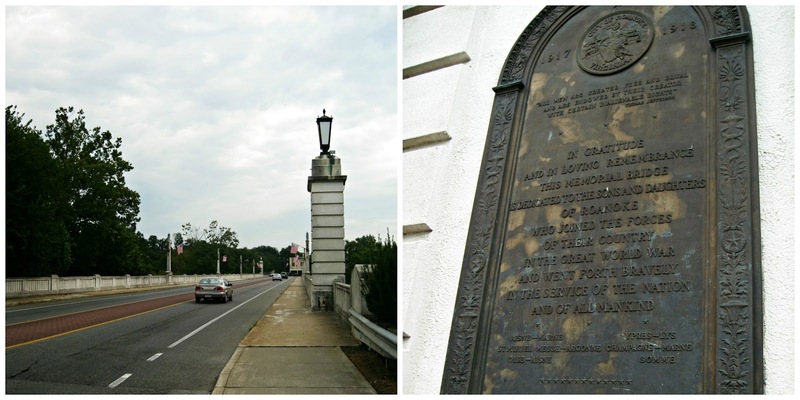 The middle picture is a rose garden, and the last picture is an interesting marker that sits right in the middle of the sidewalk along Ferdinand. Finally, back across the bridge, headed down to the greenway again. You can see in the bottom right the part of the greenway that was covered in the beginning of the run. 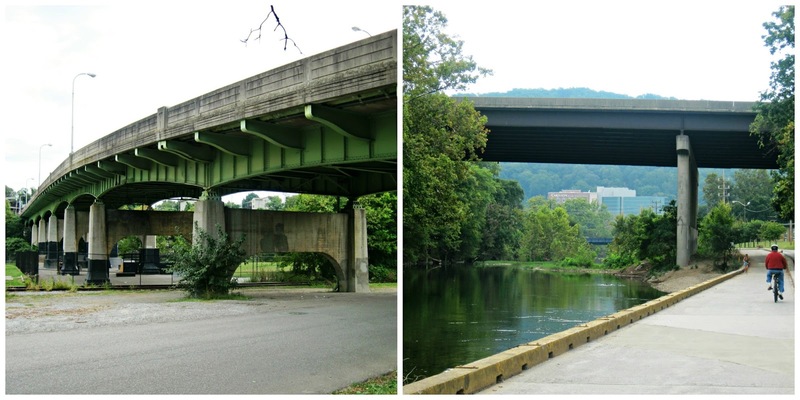 Past the skate park (which is nestled under the bridge) and over the Roanoke River again. When the river is stocked, this bridge is covered with fishermen. You can see, in the distance, the hospital - so if I ever run too hard I know where to go (ha ha). See why I love running? Maybe next time I'll take you all on the downtown loop. It's always fun too. As for my monthly summary - I ran 140 miles in September. I'll be cutting back next month to rest my legs a bit. I followed where you were running most of the time as I get over in that area from time to time. I have to admit that I saw one of those trash cans and thought it was just a sign of some sort, duh. My father grew up in that area in the 20s so he knew all the short cuts. Thanks for taking us along on the run. I enjoyed the photos very much. My son lives at the corner of Maiden and Grandin. I'll tell him to leave a hose out for you to get a drink of water :-) Hopefully, by this time next year I'll be living in that area too. That was fun "running" with you! What a great post idea. I look forward to seeing your downtown loop post soon. Some people think a lot of art is garbage. This is the other way around! You gave us a wonderful tour, Lisa. I enjoyed it. I bet it's fun to watch the changes that come with the seasons, etc. Love those trash cans! Beautiful! Thank you for taking me running . . the sites are amazing - perhaps i should move - golly, your part of the world seems fabulous. "Smart Trash cans?" I never realized. Thank you for making my day so much fun. I love how they mixed history with modern sculptures. The trash cans are super cool! Wow; you get to see some great sights while burning calories. I LOVE those garbage cans. Now, I'm peeved that my garbage cans don't email...heck, they can't even text! You do live in a beautiful area; enjoy. I had no idea any of these things were here, and they are all so col! The trash cans are unbelievable and I will have to show Phil, because when I tell him outrageous things like this, he doesn't believe me. I need to write all these down for next time I go to Roanoke! P.S. beside your trash can story, the door in the tree is my favorite, awesome! We are so happy that you are healthy- and can run- and enjoy it. Thank you for showing us where you go. Great job on the Sept mileage! I can see why you like this trail. I bet the run goes by fast with all these sights along the way! Thanks for letting us join you on your run! Beautiful scenery! That is a cool idea for the trash cans! We don't have anything at all like that here. Lisa, you are a machine! I don't drive 140 miles in a month! Glad you enjoy it. I enjoyed the tour! Amazing finds, I have seen a few doors on trees and always like the idea. Great place to run. Thanks for sharing your 'route' with us. Wow, that's quite a collection of sites! Love the solar trash cans! I have seen your pretty face in many blogs that you share. I truly enjoy reading about your life in the Blue Ridge Mountains. My family and I have been to Virginia, and we love it. I also love horses, animals, wildlife, and mother nature. I see that you have been running in the Outer Banks, NC. So, you must have met the Corolla Horses. I love wild Mustangs too. Your photos are awesome, Lisa. Thank you for joining my poetry corner, for reading and saying lovely things about my poems! About the tree with the door. It was put there by A. A. Milne. Christopher Robin lives in there. You should go check on it sometime. Tigger, or Pooh, or Piglet, or even Eeyore might be visiting. A beautiful area -- and I do love those trash bins. Very cool! The trash cans are top of the line.....!! I can certainly see why you like running along that trail. I love the idea of an compacting, emailing trashcan. That is an awesome idea. Those are cool trash cans. I seen a pink on while we were on vacation.